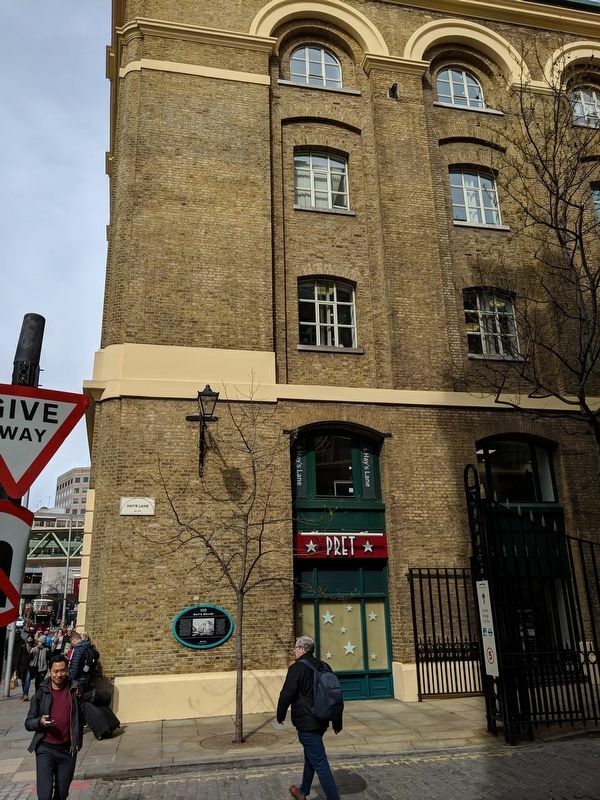 The land between Tooley Street and the Thames has been occupied by wharves and warehouses since the middle ages. Founded by Alexander Hay in 1651, the Hay's Wharf Company grew to own most of the quayside between London and Tower Bridges. 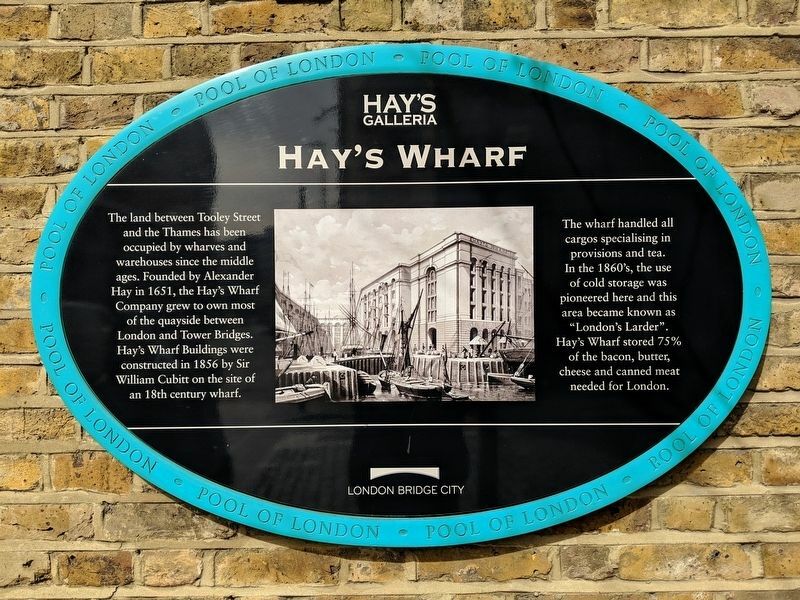 Hay's Wharf Buildings were constructed in 1856 by Sir William Cubitt on the site of an 18th century wharf. Wharf handled all cargos specialising in provisions and tea. In the 1860's, the use of cold storage was pioneered here and this are became known as "London Larder". Hay's Wharf stored 75% of the bacon, butter, cheese and canned meat needed for London. Location. 51° 30.327′ N, 0° 5.091′ W. Marker is in London Borough of Southwark, England, in Greater London County. Marker is at the intersection of Hay's Lane and Tooley Street (Route A200), on the right when traveling south on Hay's Lane. Touch for map. Marker is in this post office area: London Borough of Southwark, England SE1 2HB, United Kingdom. Touch for directions. (about 150 meters away, measured in a direct line); The Glaziers Hall (approx. 0.3 kilometers away); William Nicholson (approx. 0.3 kilometers away); St. Saviour’s & St. Olaves Girls’ School (approx. 0.3 kilometers away); Southwark Cathedral (approx. 0.4 kilometers away); The George Inn (approx. 0.4 kilometers away); St. Saviour’s Southwark Private Property (approx. 0.4 kilometers away). Touch for a list and map of all markers in London Borough of Southwark. More. Search the internet for Hay's Wharf. Credits. This page was last revised on April 13, 2019. This page originally submitted on April 11, 2019, by Mike Wintermantel of Pittsburgh, Pennsylvania. This page has been viewed 99 times since then. Photos: 1, 2. submitted on April 11, 2019, by Mike Wintermantel of Pittsburgh, Pennsylvania.